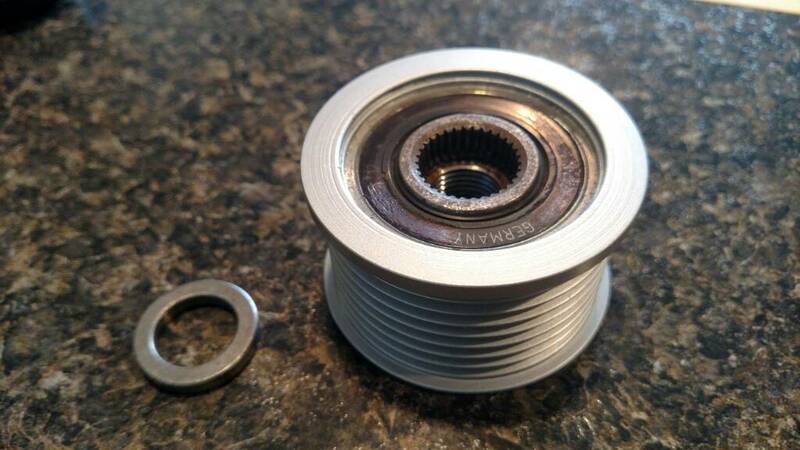 Selling an extra "clutched" alternator pulley. This is a slight overdrive pulley compared to a stock lightning. Ribbed diameter is 2.25" so at 6000 rpm the alternator will be at 18,133 rpm. It is advised that 18k rpm is the max alternator rpm so this is a good match for our platform. These clutched pulleys help your alternator live longer by absorbing load and vibrations. They freewheel during abrupt upshifts & downshifts, etc. If you've ever heard your belt squeal on a hard shift it was caused by your alternator pulley slipping on the belt. An installation socket will be needed. They are $6 on eBay. Just search for 33 spline alternator pulley installation tool. Below is a picture of the tool needed. The pulley is manufactured in Germany. Not a cheap China knockoff. This pulley has 400 miles of use. I put a fresh coat of paint on it. The pulley came off my brother's build when he was running a whipple. Now that he is twin turbo he went back to a 6 rib belt. If your alternator case looks like pic #3 (bearing shrouded) then the case flange near the shaft needs to be shaved down. If your alternator case looks like pic #4 (bearing exposed) then you are good to go. No modifications needed. $100 shipped as shown in picture. Last edited by Painless Autoworks; 12-01-2017 at 06:06 PM. Answered your question in first post. Just updated it. Thanks. Unfortunately I have no idea which one I have. Ha ha. Last edited by Painless Autoworks; 01-03-2018 at 09:20 PM. Hey Matt, just wondering how the big 240amp was doing. I understand the "queen" is in hibernation, but would like to hear your thoughts! Is it performing to your requirements? Pros and, if any, cons? I, sir, as many here at LR, do value your input !! No input yet Keith. My truck is under the knife right now. I upgraded my alternator and never installed this. Back for sale $75 shipped with the socket to install. newbie question I guess but who made these and where would I get one ?? Would you mind sending me a pm about where to get one of these too? Much appreciated.